It is difficult for me to isolate a typical day, as every day as a mom is different and every week day has a slightly different schedule, allowing for classes I teach and classes my daughter takes. So this is a fairly normal Monday, and it starts with a sandwich. A lot of housewives in Japan prepare bento for their whole family. Lucky for me, my daughter does not require one and my husband is content with sandwiches and cup noodles. Bonus: my husband uses the money he saves not buying lunch taking me out to lunch on his days off. This is why he gets sandwiches. Next is breakfast. A little something for my daughter and something easier for me. What's with the soy-sauce dish? Glad you asked. 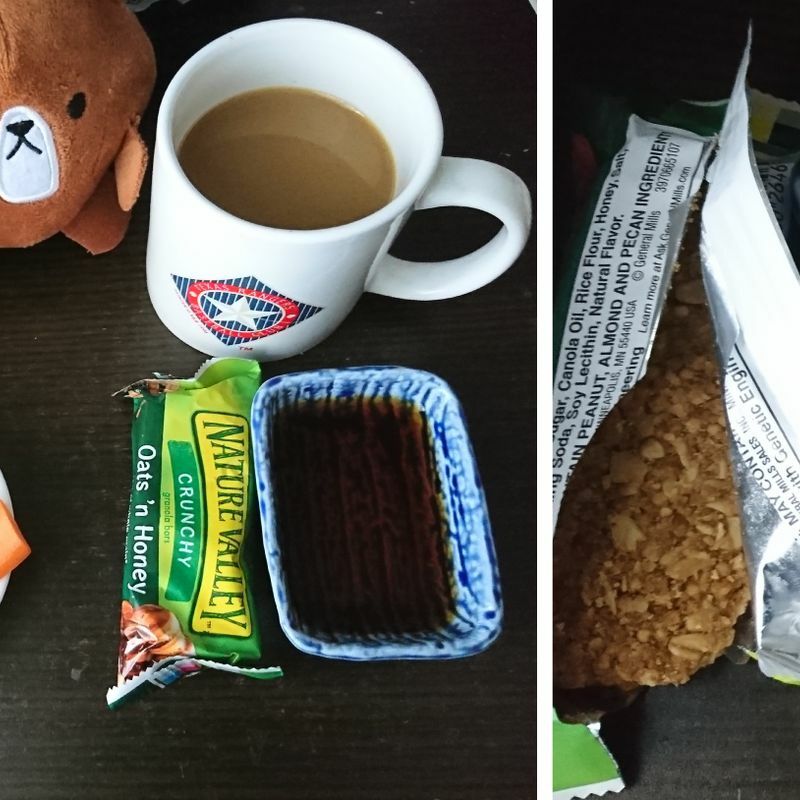 I hate the toughness of these granola bars, so I soak them in coffee, using a small dish to avoid excess granola sludge in my drink. Monday is plastic garbage day at my apartment building and there is a small shed in the parking lot with the proper garbage days and calendar noted. A good guide if you're lost in kanji is whether or not the color of the writing on your garbage bag matches the others in the garbage area. Then it's back upstairs to get the various school things ready for my daughter, who at this point is still eating her breakfast insanely slowly. I enjoy another cup of coffee and chatting with my mom while I fold last night's laundry and my daughter finishes her food. Then we shower, change, and get her downstairs for the bus. Apparently it used to be common for the moms from a school to decide a common place for the bus to stop and all meet together, but nowadays it is more common to ask the bus to stop in front of your building, which is what we do. After she's on the bus, I head out to teach at a nearby community center, then do a little shopping on my way home and have lunch. If I have adequate time, I squeeze in a workout. Before long, my daughter is home, and I notice I forgot to get something at the grocery. She changes out of her uniform, most of which goes in the wash save for the name tag. Try to remember to remove the name tag. I start a load of laundry and we go to the grocery where we find cheap tonkatsu and buy it along with some cheap cabbage-based salad mix to go underneath, because it will then take very little effort to make dinner look like this. When we get home, I hang the laundry in the shower room, which has a drying function. Hanging heavier natural fabrics (towels, jeans,etc.) closest to the air vent is recommended, as is checking back in a few hours to see what's dry and maybe flip the towels over on their hangers if necessary to help them dry. Since I had to get her new indoor shoes for school, it was time to stamp them with her name stamp. The first time I did this, I was so nervous I would mess it up by stamping in the wrong place. It turns out name tags and stamps wind up in a number of different laces depending on the parents so I went with my daughter's choice-- across the elastic band. She actually stamped them herself with these wonderful name stamps that my mother-in-law so thoughtfully gave us when my daughter started school. Then, before dinner, if there is time and she is willing, we write out the alphabet and at least her name in hiragana, just for practice. After that, there's usually dinner and waiting for my husband to come home, and sometimes we got to bed and read a book, falling asleep long before he gets in, but that's life in Japan. At least, that's my life in Japan.